The AGRICULTURAL MACHINES of the ZORMPAS S.A. company were first manufactured by the mechanic - manufacturer IOANNI ZORMPA, in 1935 at Vathilako of Thessaloniki. Later on, his two children took over the management of the company by taking advantage of IOANNI ZORMPA's large technical expertise and build a new and modern factory for the company. They also used new technical methods in order to satisfy the constantly growing demands of the market. The company enriched its production with all the kinds and models of ΑGRICULTURAL MACHINERY and expanded with a fast pace throughout the region. As of today, the company ZORMPAS S.A. has created a network of over 100 partners all over Greece. With the constant improvement of quality in its products and in combination with its competitive prices, the ZORMPAS S.A. company has managed and holds a important sector of the Greek market with top quality products, that has given it the capability to aim at the growth of its sales and the promotion of its products in the global market. 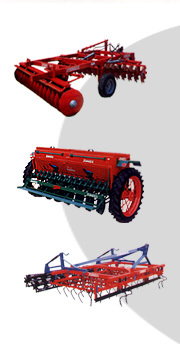 The primary goal of the company is to manufacture top-quality ΑGRICULTURAL MACHINERY, so as to ensure its perfect operation and adaptability on the most difficult soils. This is achieved through the use of top-quality raw materials, through our perfectly specialized and experienced staff, our modern plants and equipment, and our many years' experience.